Buy One, Get One Free / 50% Off on Custom Blinds, Shades, Curtains and Drapes! Hurry, Shop now! 3 Day Blinds - Custom Blinds, Shades, Shutters & Drapes. Save 20% & Free In-Home Consultation. 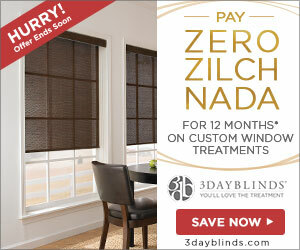 Get 20% Off Custom Window Treatments Only at 3DayBlinds.com! 3dayblinds.com has become the leading national retailer and manufacturer of quality custom made blinds, shades, shutters & drapes. 3 Day Blinds offers a wide variety of handcrafted products that add beauty and comfort to every space. 3 Day Blinds also sells Hunter Douglas, Q-Motion, Somfy blinds, & Norman products. Options include child safe products, motorized, cordless, eco-friendly, energy efficient, blackout, layering and more, all in custom tailored solutions to the exact window specifications. Expert design advice, precise measurements, high quality manufacturing, professional installation and total project management equates to a complete package of unmatched value with peace of mind. 3 Day Blinds gets you from design to install without having you to lift a finger and The client care team is ready to help you in 7 days a week. Found a coupon for 3 Day Blinds?